Starting your first AdWords campaign can be tricky. You have to learn AdWords’ confusing interface, understand what people are searching for, how to serve your ads to the right people … the list goes on. One small mistake can cost a lot of money, unfortunately. Nobody wants to make expensive mistakes, so we’re here to help you get your first campaign right. In order to choose great keywords for your campaigns, it helps to understand what makes an ideal keyword. Let’s break those down into more digestible bits of information. What is pictured in the image above? A sandwich, right? But would you use “sandwich” as a keyword? The word is relevant. That’s the first requirement for a good keyword, however, “sandwich” is too broad and non-descriptive. Check out the search results if you question whether your choice of keyword is descriptive enough. As you can see, my search result shows quite a variety of sandwiches. We see grilled sandwiches, deli sandwiches, subs and nutrition information. Even the description in the knowledge graph is vague. A sandwich could be anything between pieces of bread. So, let’s look at that image again. What are we looking at? A turkey sandwich. That’s a good word. It’s relevant and descriptive. Does it meet the searcher’s intent? Let’s go back to the search results. The results are all turkey sandwiches, so it meets the searcher’s intent. 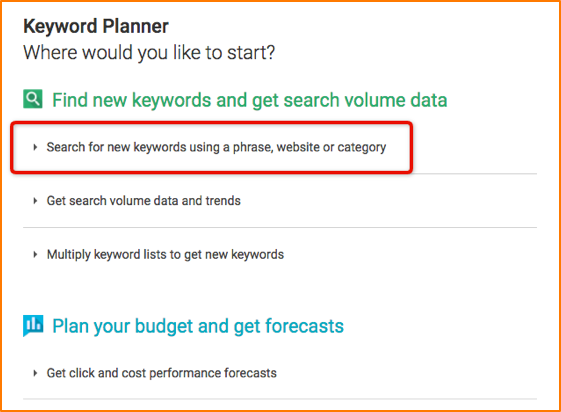 If we check out the search volume in the Google Keyword Planner, we can see that it is! 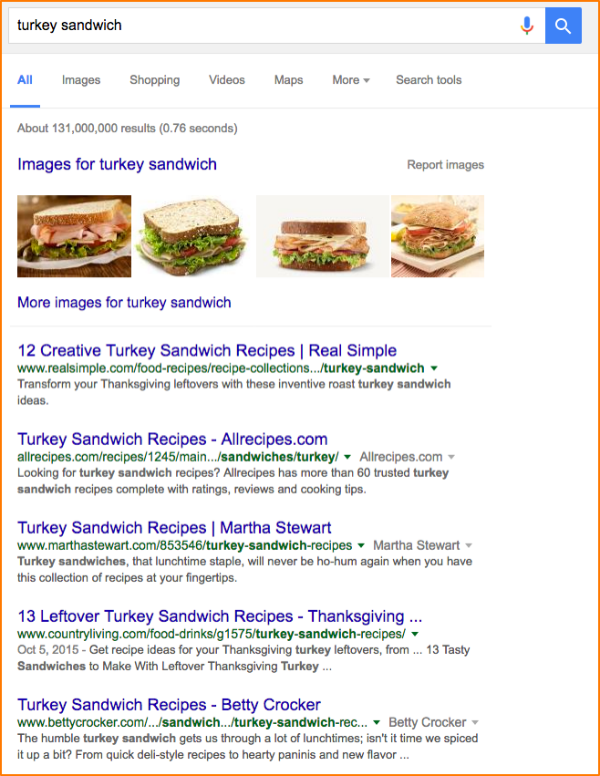 Roughly 9,000 searches a month are for “turkey sandwich”. To understand the competitiveness of a keyword, we look to the Competition column in the Keyword Planner. Google defines competition as ‘the number of advertisers that showed on each keyword relative to all keywords across Google’. You may ask, why is the competitiveness of my keyword relevant to me? Competition typically has a strong correlation to cost. 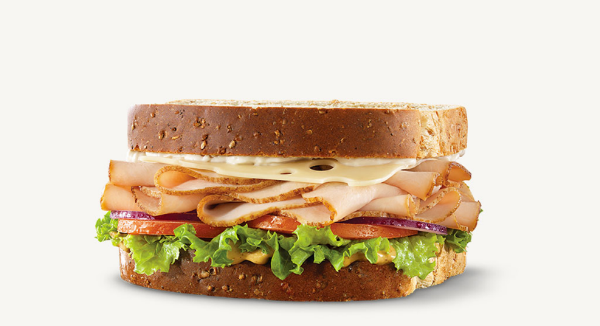 For our turkey sandwich example above, you can see in the Competition column that there’s Low competition. High search volume and low competition is an ideal combination because you want a lot of people searching for your keyword, but not a lot of people bidding on that keyword. Where Do I Find Keywords? Reviewing the client’s website – look at every page of the website that you plan to send ads to and make a list of words that people might be searching to get them there. Brainstorming – write down as many words as you can think of in 5 or 10 minutes that people might use to find that website. Go to the Google Keyword Planer and paste the URL of the website into the Search for new keywords… section and search. This will help you come up with words you hadn’t thought of. Beware though, some words won’t be relevant and you will have to sort them out. You can export the data. Go to the section right below Search for new keywords… It’s called Get search volume data and trends. Enter in the words you came up with while researching the client’s website and brainstorming. Export this set of data as well. Now, you’ll want to open all of this keyword data in Excel and sort through it for keywords with the characteristics we talked about at the beginning. Take a look at the chart below. 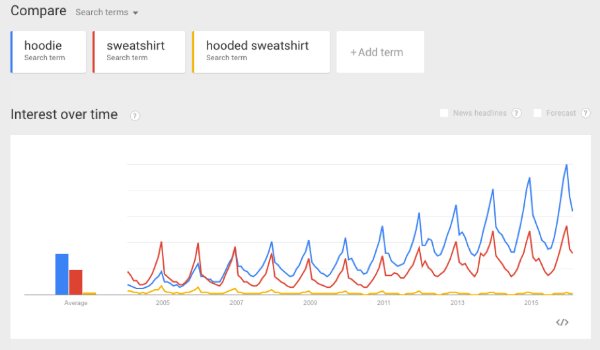 When determining whether to use the keyword “hoodie”, “sweatshirt” or “hooded sweatshirt, I went to Google Trends to get some visual data. You can see in the chart that “sweatshirt” was a very popular term around 2005 but that people regularly started searching “hoodie” around 2007 and it has dominated ever since. And then we get to “hooded sweatshirt” which drives much less volume according to Google. It never hurts to have coverage on lower volume terms, but we can hypothesize that this keyword will have less of an impact on our account than our other high-volume terms. As you can see, word variations could give you completely different results. When you find a word you want to use, prepare your different match types: exact, phrase and broad. I won’t go into detail, because that could be a whole blog post in itself, but check out Search Engine Watch’s article on keyword match types for more information. Take a look at the data in the screen shot below. This is data for the keyword “turkey sandwich” in all three match types. In this example, broad match (with the + before each word) brings in significantly more impression and click traffic, while exact (with [ ] around the keyword) drives higher CTRs and phrase (with “ “ around the keyword) drives the lowest CPCs of the bunch. Review your data by match type to make educated decisions in your campaign. How Many Ads Should Be in My Ad Group? We get this question a lot at our AdWords trainings. You can put many ads in each ad group but we recommend two. Testing is the best way to find out which phrasing works best to get people to click on your ads. We suggest setting up two at a time so that you can easily manage your test. After a month, you can determine which ad is working best. Pause the other ad and start a new test with new ad copy. You want to test one section of the ad. So, if you have two ads running, one section of copy should be different. We’ll Be There In 15 Minutes! In this scenario, I’m testing the first line of ad copy to find out if “gourmet” or “mouthwatering” is more effective in getting users to click my ad. Check out Nick Eppinger’s 2-part blog post on how to test ad copy for some really helpful tips. Should I Use Ad Extensions? First, what are ad extensions? They are tidbits of relevant information you can assign to your text ads to increase CTRs, conversions and awareness. There are many types of extensions you can use, but these will be the most useful when you’re starting out. Think of sitelinks as mini ads for your web pages under your ad. You can choose in AdWords which pages you’d like to advertise under your ad. In the ad below Nike has a general ad which includes sitelinks to some of their most popular products. The call extension gives the user an opportunity to click on the ad and call directly from their phone. Call extensions will show up on both desktop and mobile devices. On mobile devices, it will render in a click-to-call format, meaning – a user can call directly from their phone after clicking on the “call” button/icon. This is a great extension for local businesses (like plumbers, pizza shops, bakeries, etc). 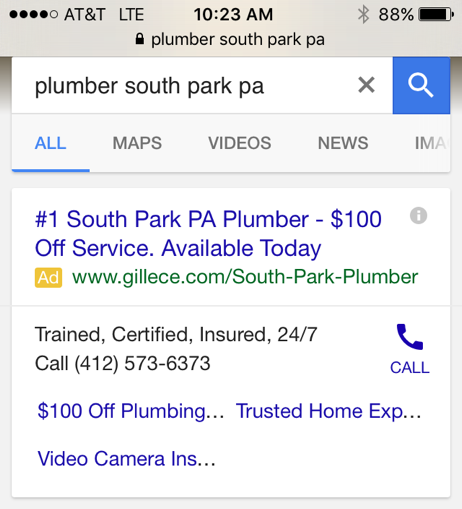 Callout extensions lets you include additional text with your search ads. This extension is not clickable. You might use these to show that you offer free shipping or to promote a sale. This extension lets you add your address to your ads. This is perfect for a pastry shop like Moio’s because it’s a local business. People searching for the company may be looking for directions, and if they are, this extension will help them find what they’re looking for quickly. You are required to have a Google My Business account for this to work. You’re all familiar with reviews. You probably search for them before you buy something online. This extension allows you to showcase your stars. This is very helpful if you have an average 4-5 star reviews. How Do I Target a Local Audience? Targeting is very important, especially if you’re running ads for a local company. There are a few targeting options in the campaign settings that can help you show your ads to the right people. Let’s say, for example, you own a pizza shop with several branches in and around Pittsburgh. You’re also running ads to raise awareness and get more business. 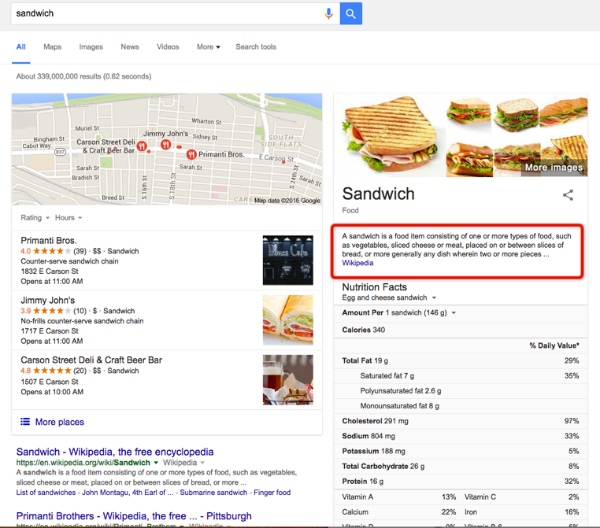 To ensure you’re targeting the right audience, you need to make sure your ads only appear in Pittsburgh. You would go to the campaign settings and about half way down the page you’ll see a section for location (image below). You can set your branch locations there as well as exclude locations if need be. If you follow these tips when creating your campaigns, you’ll be golden! All the best for your first campaign.